I cannot believe that I am writing my final favourites blog post for 2016. Last year just flew by far too quickly. It doesn’t seem like two minutes since I started my blog and now it is a whole year old. I have to admit that even though it is challenging at times, I do really love it and I wouldn’t change it for the world. I think I need to start this favourites video by talking about my new forever favourite, my puppy. As you may know from other posts I had to have my dog Mika put to sleep in August. Honestly, it was the hardest thing that I have ever had to do. She was my baby and I brought her up from a little scared abandoned puppy to an amazing dog. Losing her hit, me so hard, it was sudden and so traumatic. So, I knew without a shadow of a doubt that I needed another dog. When I met my new little pooch, I fell instantly in love with her and I am obsessed. She is my new little best friend. In the next year, I want to get another puppy for her to have a little playmate for while I am at work. So far she seems to be settling in really well and I can’t wait until we can go on nice long walks together when the weather gets a little better! I seem to go through stages with this foundation. For me, I have always been in the mindset that a foundation should be full coverage, or what is the point in wearing foundation. This foundation is a medium coverage that can be built up but it is really nice and easily blendable. I use this foundation with my Morphe M439 brush and the pair work together flawlessly! For concealer, all I have wanted this month is just something quick and easy. The other thing that I love about this concealer is that it is nice and hydrating on the skin. In the winter, I do get pretty dry skin so this just stops my under eyes from looking dry. Especially when I blend this concealer out using my damp Beauty Blender it looks like a dream! This is the only mascara that I have been wearing for a while now. It is a great quality mascara for the price. I really do find that this mascara rivals the popular high end products that are out there at the minute. I have never really been obsessed with a mascara before because to me they all do the same thing, but this one I have notices a big difference with! Running around after a puppy means that over the last few weeks I haven’t been able to take my time getting ready because I’m always making sure that she isn’t chewing my dressing gown or weeing all over the floor. So, my brow wiz has been my go to. Even when I am wearing minimal makeup I always make sure that I even out my brows and fill my sparse areas in. This is great because I don’t have to mess about with brushes and it is so quick and easy to use! I know that I did a post on this perfume not that long ago but I feel like I need to mention this again. Since buying this I have been hooked on it. Here on my blog I have mentioned Chanel No5 so many times that I probably drive you all mad, but now I have a new favourite. This is the only perfume that I have worn over Christmas and I can’t see myself changing anytime soon. It is lovely and deep and musky and perfect for the colder months! I know this is shorter than my normal favourites posts but in between running around after a puppy and Christmas, I haven’t had two minutes to try out new products! As normal with all my posts I will link above to where you can pick these items up. Also, please feel free to leave me any comments below and I will get right back to you. I NEED to try a makeup forever foundation! I love it, I have used it near enough every single day for the longest time! 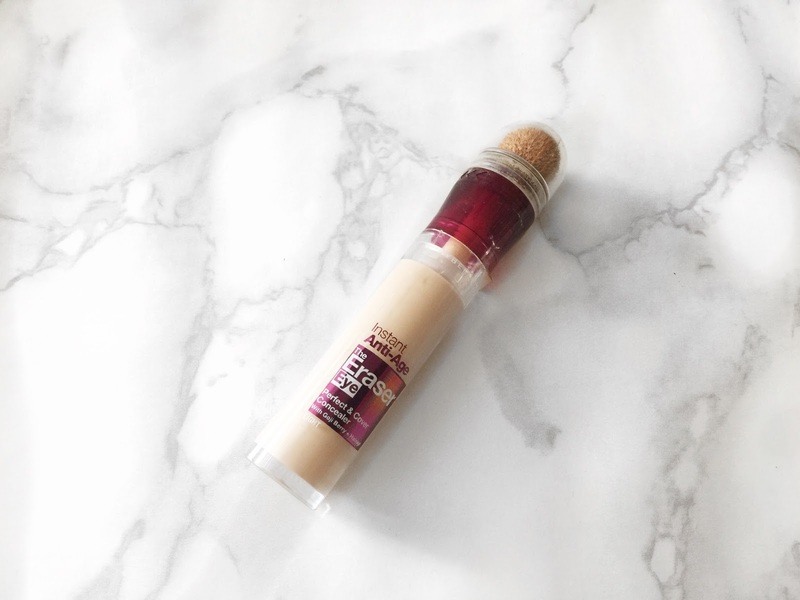 It is my ultimate favourite drugstore concealer, the Maybelline Fit me is a close second! It is such a good concealer. Plus, the MUFE foundation and the Maybelline concealer go together really well!